Mike DeLuca is quick to say this honor is not about him or his family. It’s about the service he can do and the people he can help. Mike comes from a long family tradition of service. Witnessing his father’s great acts of kindness and charity in his daily work and life had an impact on Mike at a young age. A lot of people, he said, work hard but don’t add an element of service to their lives. Giving back through volunteering sounds like a cliché, but it’s true. Mike’s face lights up when he talks about the friendships that are forged, the community that is built, and the people that are helped through volunteering. Mike’s grandfather, uncle, and brother have all been Kiwanians. Mike joined Kiwanis after graduating college in the early 1980s and was fortunate to serve in the Kiwanis Club of Greater Lawrence with his grandfather before he passed in 1997. Mike recalls seeing his grandfather come home tired after working in the mills of Lawrence, but always willing to volunteer and pull the family together. A civic service organization like Rotary International, Kiwanis International has more than 600,000 members in more than 80 countries. Kiwanians serve the needs of children through local service projects and fundraising, hosting nearly 150,000 service projects each year. Following his family’s commitment to service, recognizing and honoring veterans is important. Mike’s father was in the Coast Guard. His uncle was in the Navy. Every year, the Kiwanis Club of Greater Lawrence honors the memory of Andover resident and World War II hero George Street with a clean-up of the Greenwood Avenue George Street Memorial Bridge. George Street, commanding officer of the U.S.S. Tirante during World War II, was decorated for his outstanding service. Mike’s leadership of the annual clean-up of the George Street Bridge earned him an award from local Veterans Services. What will community service look like for future generations? Through his work with Kiwanis Key Clubs in Andover, Methuen, and Lawrence, Mike believes that service clubs will evolve to meet the needs of a new, more global generation. The former model of weekly meetings will give way to new ways of serving, perhaps through smaller, more focused projects and events. Stay tuned. If the next generation of volunteer leaders asks the same question Mike does – “what am I doing today to make a difference” – amazing things will happen. "I just love this town!" That's what honoree Wendy Schwartz Donohue said about her volunteer service to this town. Wendy and her husband fell in love with Andover in 2008. Settling down in Andover with her family, Wendy learned more about her community and its needs. Wendy's volunteering began with Bancroft Elementary, where her children go to school. With her professional background in marketing and communications, PTO Communications Chair was a natural first step. Getting to know the school community, Wendy saw a need for and pulled together a parents' support group, for parents who need a little extra support to help navigate the system. Wendy likes to look for the big picture, to see how all the pieces fit together. “If we all work simultaneously and together,” she said, “we will shape the future so that we all benefit.” Where some people see challenges, Wendy sees opportunities. Her personal challenge, she says, is that she can’t say no. Living within walking distance of downtown, what happens there is important to Wendy. That’s what led her to become involved with the Historic Mill District, the town yard, and other projects. How can we bring a playground to downtown? Start a Facebook page, spread the word, and encourage parents to attend Town Meeting. How can parents attend Town Meeting? By providing babysitting. Funding for a downtown playground was approved at Town Meeting in 2016, and in 2017 babysitting will be available every night of Town Meeting. In 2016, Wendy attended a community meeting about the Historic Mill District and the town yard. Seeing the possibilities of sharing all this information with her demographic of mothers and families, Wendy started the Andover Today and Tomorrow Facebook page, with its signature Transformation Tuesday posts. She continues her work to share information about a proposed new development on Dascomb Road. Through all her volunteer activity, Wendy is inspired by her father, who passed away in 2007. Her father was mayor of the Ohio town where she grew up. “He saw needs in the community and just started working on what could be done.” Following in her father’s footsteps, Wendy said, “If I see something that I can fix, I can't not try. Sometimes it doesn't work out , but usually it does. 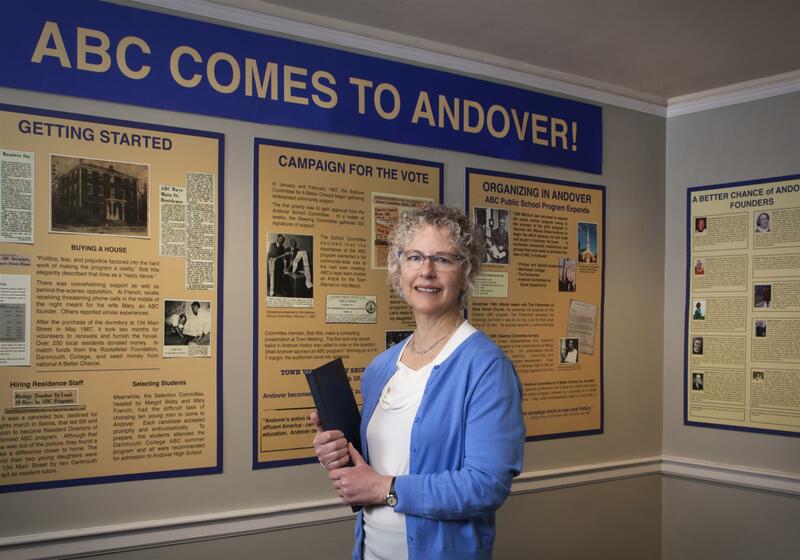 It just takes effort.” Andover is fortunate that Wendy Donohue makes the effort. Jon and Kim Glesmann’s involvement with the Boys & Girls Club of Lawrence started with the West Parish Church Men’s Group and a drive-by. Following a Men’s Club meeting when they talked about volunteering, Jon happened to drive past the Boys & Girls Club. He thought that he could help kids with college prep and application. However, when the volunteer coordinator took him into the homework room and he was surrounded by little kids, he was hooked. A year later, his wife Kim joined him. Now Jon and Kim go to the club afternoons and help students from 1st grade through high school. Retired as a special education assistant, Kim works with younger students who need a little extra help. It’s a treat for Kim to see kids flock to her table in the homework room thirsty for attention, encouragement, and consistency. “A lot of the students come from single parent homes where often English is not spoken, so ESL help is important,” Kim said. There’s a big smile on her face when Kim talks about the hand-drawn pictures displayed proudly on the fridge at home, just as she must have done when their own two children were growing up. Both Jon and Kim have been honored by the Boys & Girls Club for their volunteer service. The real reward is evident when they start talking about individual students and their pride in these student accomplishments is clear. One of the first students Jon tutored will graduate from Fitchburg State University this May. Another high school student who was struggling with school reached out to Jon the day his older brother moved into his dorm at UMass Dartmouth. Seeing what was possible inspired him to change his own life. West Parish Church suppers and fairs raise funds for scholarships. So far twenty-nine students have received scholarships, but the story doesn’t end there. The Men’s Group continues to support students. It might be help with books, or even a surgery not covered by health insurance. Or it could be a car. Jon supports three to four VWs for Boys & Girls Club graduates, regularly fixing brakes and other automotive maladies. Jim and his wife Katherine moved to Andover in 1987, brought here for his work in the computer industry. Looking for a town halfway between his territory in northern New England and the main office in Natick, Andover fit the bill. Their two daughters, Hallie and Emma, grew up in Andover. Jim’s volunteer service started with South Elementary and continued on to West Middle and Andover High School. At West Middle School, Jim noticed the school’s overgrown and neglected center courtyard. He went to the principal with a plan to bring the courtyard back to life. Working with parents and student volunteers, they weeded and planted and created a beautiful space. Back in the 1990s, the middle school still had a woodworking shop. So Jim and the shop teacher worked with students to build wooden benches to create an outdoor classroom. Jim’s service through the Mother of Good Counsel Knights of Columbus Council #1078 can be described as one of helping others within the Council and District do the good work they do. He served as Grand Knight for his own Council and is District Deputy working with five to six regional councils. He is the membership director of northern Massachusetts and is the color corps commander. 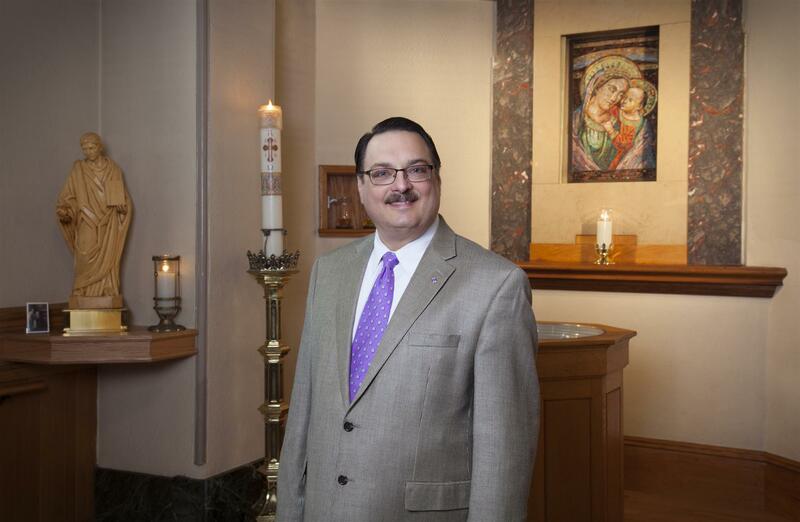 He has helped found other Knights of Columbus Councils in Lawrence and Jamaica Plain. Putting his volunteer service in perspective, Jim recalls the four pillars of the Knights of Columbus: charity, unity, brotherhood, and patriotism. Of the four, charity is the most important. When you meet Brad Heim, it’s clear he is a people person. He seems to know everyone, how they are connected, how they could become more connected – and it’s impossible to say no to him. Brad is motivated by being around people who give. 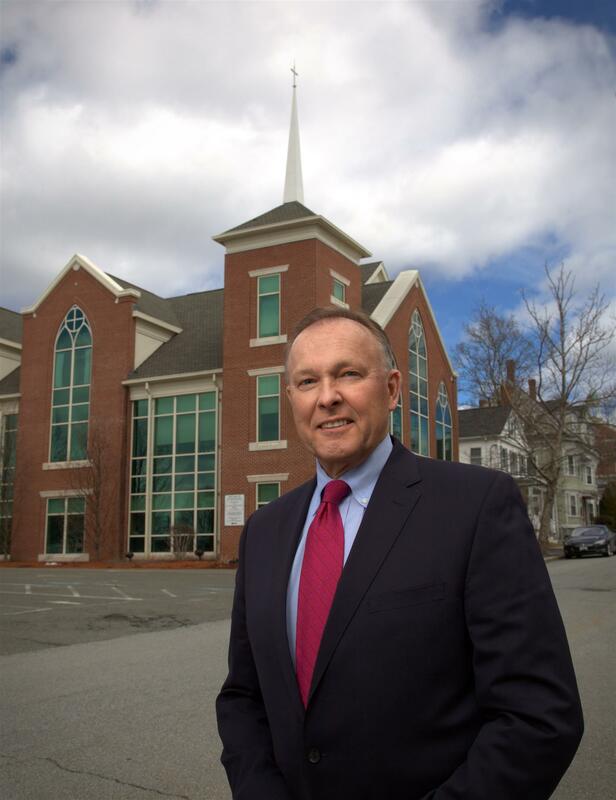 In rapid succession he lists his father-in-law Enzo Fosella, Mike DeLuca, and people who serve as selectman, on town committees, and in their faith communities. “The guys who show up at 5:45 every Thursday morning to cook breakfast at Lazarus House don’t have to be there,” Brad said, “but they can give back and be on their way to work by 7:15. If their company doesn’t like it, they’re working for the wrong company.” It’s hard not be inspired. Brad met his wife Joanne through the Service Club of Andover. Joanne’s father Enzo was the founder of the club, and their meeting was clearly a set-up. Married in 1997, they moved away to Chicago but came back to Andover in 2000. Although they live in southern New Hampshire now, they both spend time in Andover at St. Augustine’s Parish where Joanne works part time and Brad teaches Christian education. Service Club focuses on serving youth and people with disabilities. Their service includes a high school mentoring program in which students spend time shadowing a mentor in the field of their choice. A new school-based program is Credit for Life. 400 Andover High students will work their way through 15 stations, each representing a different aspect of everyday life: housing, transportation, banking, and more. Brad is recruiting the over 100 community volunteers who will staff the booths. Service Club hosts an annual Rose Ball, for people with disabilities. They sponsor annual Field Games for people with disabilities, while the Knights of Columbus, another organization Brad belongs to, provides the food. The Club works with the Professional Center for Child Development (they painted the building), Creative Living (they fund a weekend respite for clients and caregivers), In Control Driving School (they provide scholarships for local students), and much more. Brad speaks warmly about the annual Men’s Christmas Eve Breakfast. What started with two men has grown to over 200. With carols sung and remarks made, the room fills with the sound of 200 male voices singing Silent Night. “This is the most faith I’ve ever seen exhibited by men in one room,” Brother Rene from Central Catholic told Brad. It was that faith that inspired the men to fill a van with baby and infant supplies when Neighbors In Need was running low. More important than not being able to say no to Brad, saying yes to him makes amazing things happen. Seeing her spend time with special needs students, Kerry Manuel’s 1st grade teacher told her mother that Kerry is a nice leader, not a bossy one as young children can so often be. Growing up with a severely disabled aunt, Kerry always had a soft spot in her heart people with special needs. Kerry now visits her aunt to spend time, talk with her and feed her. The best thing, Kerry said, is when she gets to hear her aunt’s happy, contagious laugh. Although Kerry wasn’t enthusiastic about learning to play the piano, her first piano teacher took her to Marland Place to play for the residents and then interact with them and play board games. Playing for the residents gave a purpose to her piano playing and she enjoys making people smile and laugh. 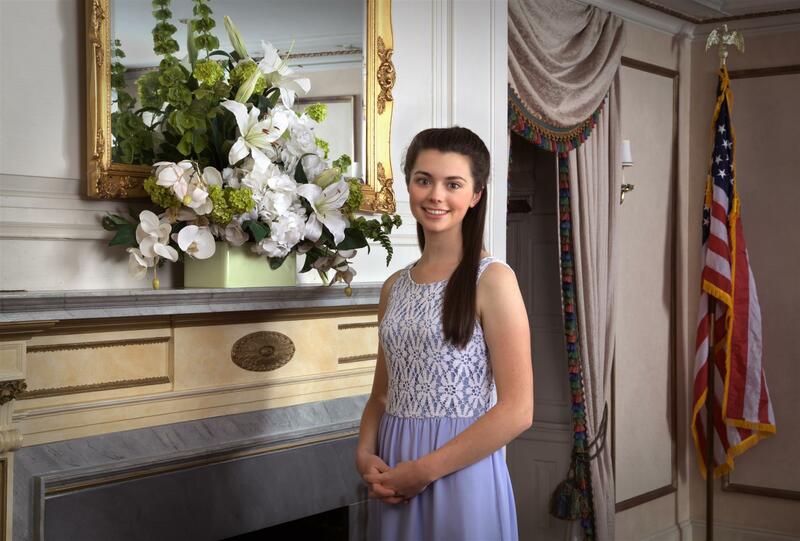 A senior at Andover High School, Kerry followed her sister Shannon’s footsteps in becoming president of Interact Club, the high school Rotary Club. She fell in love with the idea of “Service Above Self.”As a freshman, Kerry was part of the Interact team that helped with a Citizens Who Care gala. Listening to the stories about unsung heroes and the Student of the Year she thought, wouldn’t it be great if that was me? Fast forward four years, and here she is. Under Kerry’s leadership, the Interact Club is very busy. The Interact Club raised $7,000 in a 50/50 raffle at a Celtics game in Boston Garden with proceeds donated to Special Olympics. When the Club heard Assistant Principal John Norton’s story about the underfunded school in Roxbury where he used to teach, the club was inspired to help and got to work raising money. On April 12 Interact members went to the school to deliver Chromebook tablets to 5th grade students. In the end, the computers themselves were less memorable than the happy students who received them. She walked away feeling grateful for what she has, knowing how important it is to give back. Kerry is also a student ambassador, helping with freshman orientation and tours. She has worked on Red Cross drives and is the volunteer coordinator for the 2017 Run for the Troops. As she heads off to Bates College this fall, Kerry said, “My future plans are very undecided, but I know I want to work with people and leave a bright mark on whatever I end up doing! A realtor in Andover for over 20 years, Mary used her work as a way to help the women who used the Women’s Resource Center as a shelter from domestic violence. Through her work with Coldwell Banker Cares, Mary raised funds to support domestic violence prevention – and she found a unique way to help women who used the shelter. Today Mary is President of the Board for Delamano, a Spanish-language domestic abuse hot line open in Lawrence from 5:00pm to 8:00am, after other local hot lines close for the night. 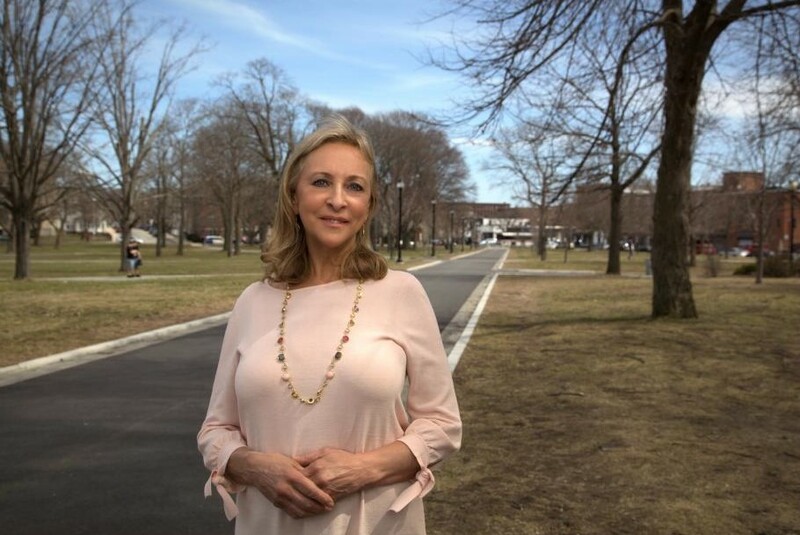 Delamano, Spanish for “holding hands,” fills the gap and maintains local and cultural ties for victims, rather than referring overnight calls to Boston. Every September 26th, Delamano hosts the Brides March. Women dressed in wedding gowns and men dressed in black march to honor Gladys Ricart, who was murdered on her wedding day. Delamano also hosts an annual International Women’s Day dinner to honor a woman who has made significant contributions against domestic violence. From her own life experience, Mary knows that sometimes it’s the hardest things that happen to us that lead us on a path to something good. A 2006 diagnosis of multiple sclerosis led to two years of pain and medication. Deciding to find a healthier way to manage the disease, Mary attended the Institute for Integrative Nutrition, in New York City. Applying their holistic approach to health, by April 2008 Mary was medication free. Her journey led her to become a Holistic Health Coach and the author of two books, the first one co-authored with George Forman III. Mary also serves on the board of directories of the Sumaira Foundation which raises funds to find a cure for neuromyletis optica, a neurological disease that blinds young women. Of course, in addition to all her volunteer work, Mary spends time with her family, children, and grandchildren. A Lawrence native, Brian McNally got to know Andover in his teens when his mother worked for the Andover school superintendent. While attending Springfield College, Brian did his student teaching in health and physical education at Andover’s East Junior High. In a fortuitous coincidence, Brian graduated on a Sunday in May and, due to a staff retirement, started full time work on Monday. Brian has a strong belief in the importance of education, and that education starts with one’s own health and well being. “There are a lot of clichés in teaching,” Brian said, “but no one ever died from not knowing their physics or history, but anyone could die if they don’t know how to care for their health and well being.” Brian likes that he can help students understand that no matter what career path they choose, they can help themselves to be healthy along the way. After graduate school and working away from Andover, Brian returned 16 years ago. 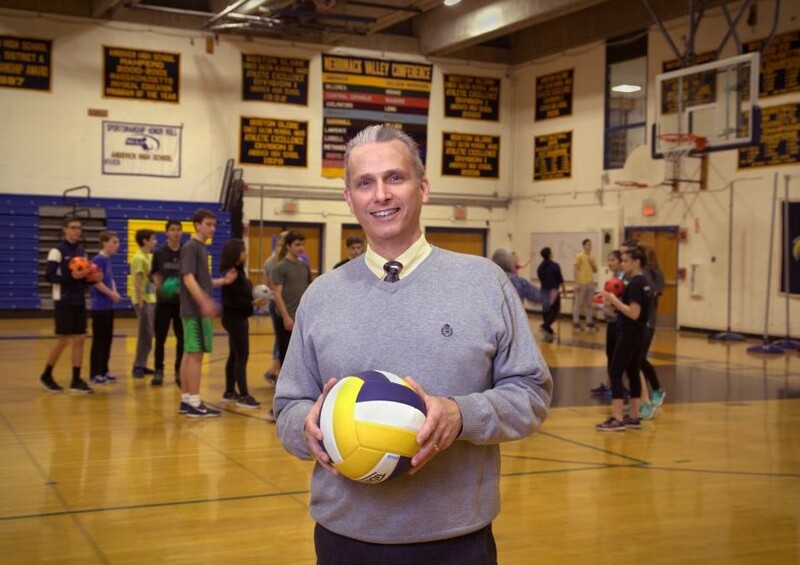 As the coordinator for Health Education and Physical Education for all Andover Public Schools, Brian is a fierce advocate for students and families in Andover. He continuously researches curriculum and resources to ensure the highest standard of education for 6,200 students from Kindergarten through grade 12. Brian has raised funds through grants to support creative problem solving, classroom movement, activity break cards, and heart monitors. He is the chairperson of Parent to Parent, a group of parent volunteers who organize speakers to educate the public monthly on health and wellness topics. Substance abuse education has always been a part of the health curriculum, but with the present opioid crisis looming large, Brian works with health care professionals to educate parents, community members, and students through workshops, speaker presentations, and student health and wellness fairs. He is the main presenter of the adult education program Hidden in Plain Sight. An ongoing challenge for Brian, his staff, and students is the rising trend for stress and anxiety that affects students from elementary through high school. Mary grew up in what she calls a Missouri cow town, raised by parents who were deeply engaged in integration and fair housing. Mary’s father was on the national board of Habitat for Humanity, traveling around the world for the organization. Her parents gave her a model for how to be involved. It was up to Mary to choose her own path. Mary moved east to work in international development at Boston Oxfam America. She was the desk officer for Latin America and the Caribbean during the 1980s, an extremely difficult time to be working with South America. Following her work with Oxfam America, Mary decided to stay home with her children but continued to do community work with the schools and The Mother Connection. Her involvement with Pike School’s community service club opened her up to service opportunities in the community for herself and her children. Lyn Eikenberry is credited with recruiting Mary onto the board of A Better Chance of Andover, the ABC House. Inspired by her parents’ model, Mary always wanted to be a part of something important. At first ABC House seemed small, but Mary saw the she could have a greater and more personal impact on students’ lives because she was able to work closely with them. Through her board service, Mary is one of the leaders ABC House’s 50th anniversary celebrations and gets to be a part of visioning its future. The ABC House 50th anniversary is a time to thank faith communities, students, teachers, board members, volunteers, host familes, and the town of Andover as a whole for making the bold decision to open ABC House in 1967. Going forward, Mary is most excited about a new ABC effort, Courageous Conversations, a project to bring people together to tackle conversations that might be uncomfortable, but are critically important nationally and locally. Courageous Conversations started this winter with a film screening of The House We Live in episode from the PBS series Race: The Power of an Illusion. Dr. Damany Fisher from Phillips Academy led the discussion at Memorial Hall Library. In 2016 Jon retired after serving 29 years as the games director for the Special Olympics Massachusetts August Tournament, one of five tournaments held around the state. The August tournament is the second largest in the state with over 1,200 athletes and coaches competing in softball, bocci, golf, fishing, and sailing. Special Olympics Unified Sports brings together athletes with intellectual disabilities and athletes without intellectual disabilities to train and compete on the same team. Running the tournament, Jon said, is like bringing the circus to UMass Amherst. They roll in with trucks filled with banners, signs, and sporting equipment on Friday, and set up games, bocci courts, everything that’s needed to run the tournament. Games are held Saturday and end Sunday with a barbecue. A member of the Lawrence Rotary Club since 1988, Jon manages the club Read-Aloud program at Lawrence’s Guilmette School, sponsoring readers in 1st to 4th grade classrooms to teach students the importance of reading. Every December, Jon and Lawrence Rotarians throw a school-wide Christmas party, complete with carols and Santa Claus, 600 Christmas presents given to students. Youth Explorations in Science enrichment program. In bi-weekly club meetings, students build working experiments that they get to take home and then share with their class the next day. At year end, the club goes to Philips Academy to launch their Estes Model Rockets. And in June Jon runs a barbecue for the entire school, working with the lunch ladies on the grilling and hosting Spunky the Clown for the older kids. 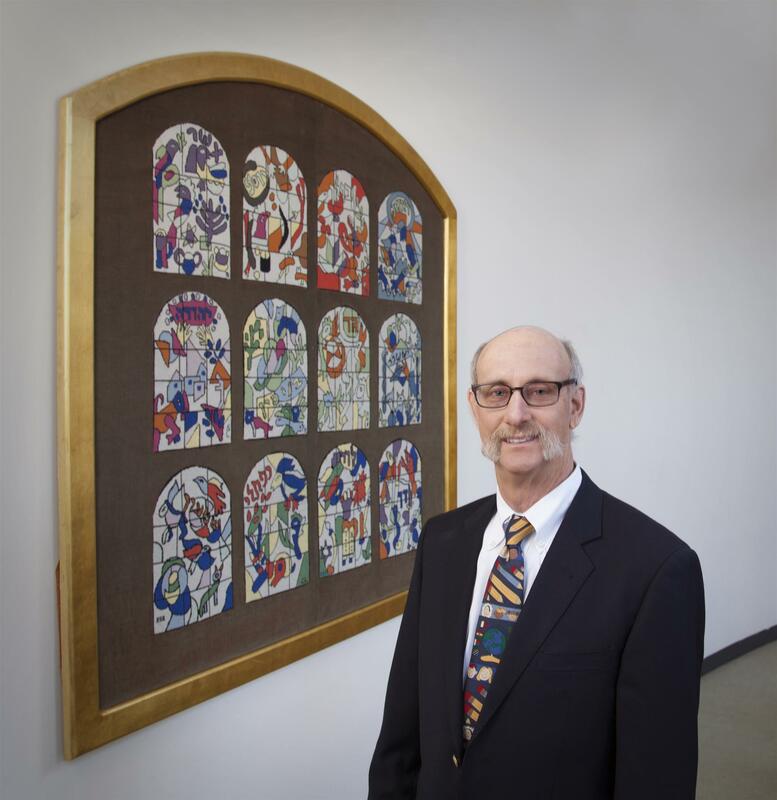 Away from the Guilmette School, Jon is deeply engaged at Temple Emanuel, having served among other roles, as treasurer for 30 years. Not one to sit still for long, Jon also rides his bike 120 miles a week. He has ridden the along the Pacific coast, from San Francisco to Utah, and from New York to Boston to raise money to support Alzheimer’s research. You might see him around Andover during his daily 20-mile ride, or when he walks his rescue dog, Diesel, along Central Street.